Fabulous Preston Development new home community with awesome amenities ready for you to enjoy! New Dock on Taylors Creek, Kayak barn for your use, impressive Clubhouse and pool. Don't forget to ask us about the latest details on Traders, soon to be open! The McCoury plan has Owner's suite on first floor, open living and Kitchen area. Studio over two car garage offers a great guest or office space. 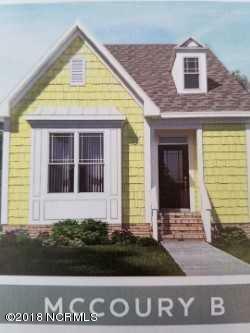 Home has ivory cabinets, quartz counter tops in kitchen, mosaic backsplash, upgrade interior paint color and privacy in rear! NO DESIGNATED FLOOD ZONE in this community so flood insurance not required! Photos of actual home will be shown once home is close to completion! Finished studio over two car garage has full bathroom and kitchenette, not included in stated sq ft.